We took off for the return to combat at Stirling Island. Weren’t here an hour before the blow fell. Our crew is again split into four other crews. Guess we can’t win. Disgusted is the word for Wynne. This outfit drills half an hour a day, 4:00 to 4:30 p.m. School tomorrow morning, mess kit inspection in the p.m.
Prayers came easily tonight and I asked that disgust be warded off, as it has always been a cancer or a blight to me. After disgust takes over, don’t give a damn for anything. Thus far, haven’t been hurt. Someday, maybe. 1 The Saturday Evening Post had the widest circulation of any American weekly magazine. The Saturday Evening Post (http://en.wikipedia.org/wiki/Saturday_Evening_Post : accessed 27 June 2014). 2 Wayne occasionally mentions a “Bible lesson”. Did the military chaplains provide the troops with Bible lessons to help them through the war? 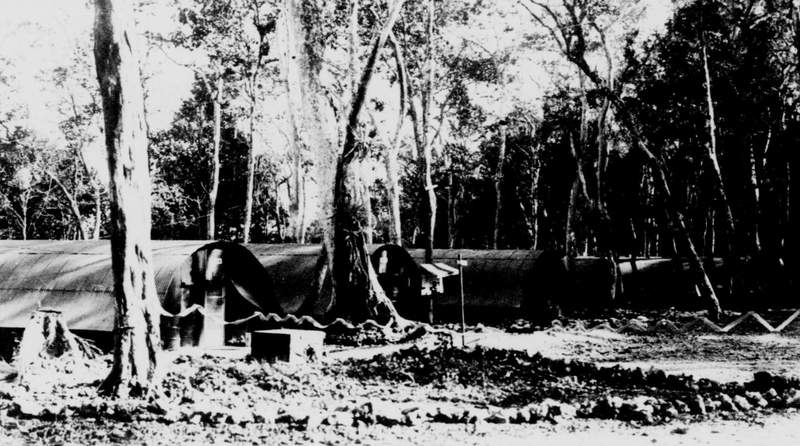 3 The 42nd Bombardment Group combat crews’ quarters were located among jungle trees on the southwest end of Stirling Island. 42nd Bomb Group Historical Report for June 1944. Headquarters 42nd Bombardment Group (M), 1 July 1944, microfilm B0131, Maxwell AFB, AL: Air Force Historical Research Agency, 1973, frame 1801. On 28 June 1944, Bonnie’s 23-year-old brother, Ernest M. Gibbons, was inducted into the US Army at Fort Bragg, North Carolina. He will serve as a Private with the 41st Armored Infantry Regiment of the 2nd Armored Division. During the Battle of the Bulge, 2nd Armored Division, nicknamed “Hell On Wheels”, fought in eastern Belgium, blunting the German Fifth Panzer Army’s penetration of American lines. The 2nd Armored Division, part of Patton’s Third Army, helped reduce the Bulge in January, fighting in the Ardennes forest in deep snow and freezing winter conditions. Three of Wayne’s brothers are in the war, two in the US Army Air Force and one in the US Army. Bonnie’s brother has just enlisted in the US Army and her sister’s husband is in the infantry in Italy. Today, it is difficult to imagine a world in which everyday many of your family members were at risk of being wounded or killed. This entry was posted in Uncategorized and tagged 100th Bombardment Squadron, 2nd Armored Division, 41st Armored Infantry Regiment, Battle of the Bulge, Belgium, Bible, Bible lesson, Ernest M. Gibbons, mess kit, Patton, Quonset huts, rain, Saturday Evening Post, Stirling Island, Third Army. Bookmark the permalink. Here again the importance of the crew to any airman is cleary seen. Russell, a radio operator, and Seehorn, a flight engineer, with whom Wayne had trained at Columbia Army Air Base at Columbia (C.A.A.B. ), South Carolina were very close friends. He was also friends with the pilot, Finchum, and the bombardier, Tolhurst. They became a team at C.A.A.B. and could count on each other. Their relationships extended beyond them to their families. They were all in this together. I know of at least one instance where Wayne’s father, traveling from Colorado to Indiana, made a detour in Kansas to visit Finchum’s family. I wonder if there weren’t many instances, now long forgotten but that might be discovered in wartime letters, of families of aircrews staying in touch and visiting with each other? Mr. Corbeil told me he flew once with another crew without telling his pilot. His pilot was not very happy because if something had happened to him the other crew members would have had to go back to training with someone else to train as a mid-gunner. He is the same veteran who told me about the Nissan hut that were called Quonset. You will find at the following link, http://quonset-hut.blogspot.com/p/quonset-hut.html, a full history of the Quonset hut and its British forerunner, the Nissen hut which of different design and construction. When all is uncertain and life-threatening, a crew is comforting. To have it broken apart, is like taking away a security blanket. Disgust, indeed! The aircrew is a self-supporting unit in which everyone can count on the other. Throughout Wayne’s Journal, his disgust at not being with his original aircrew is evident. Apart from them, he becomes depressed, although in those days the term might have been “disgusted”.